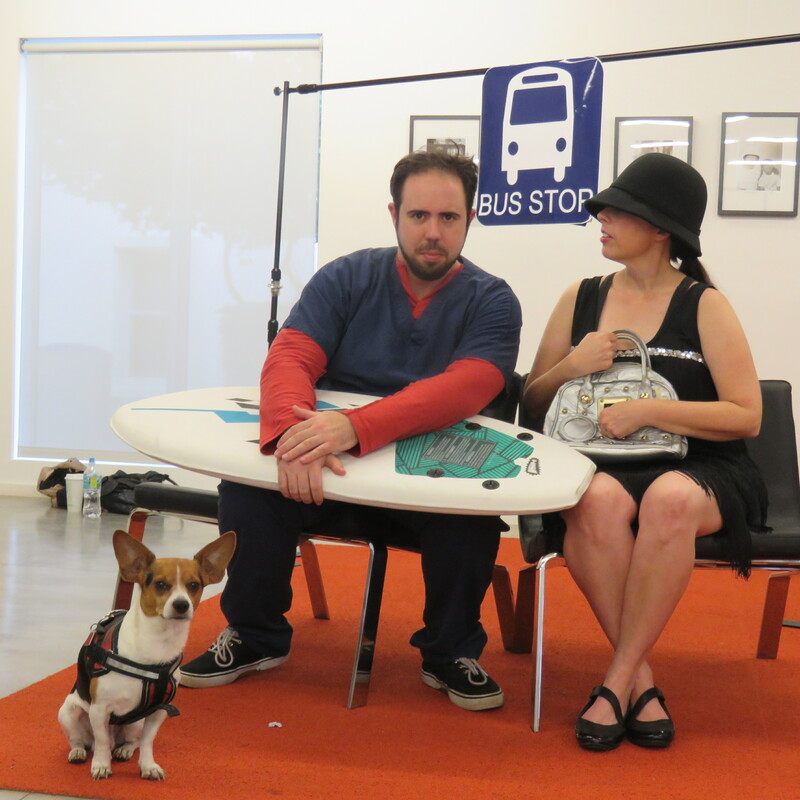 Alex Marante, as Frederick, with Rachel Galvin, as Vera (with photo bomb by Bentley the dog). 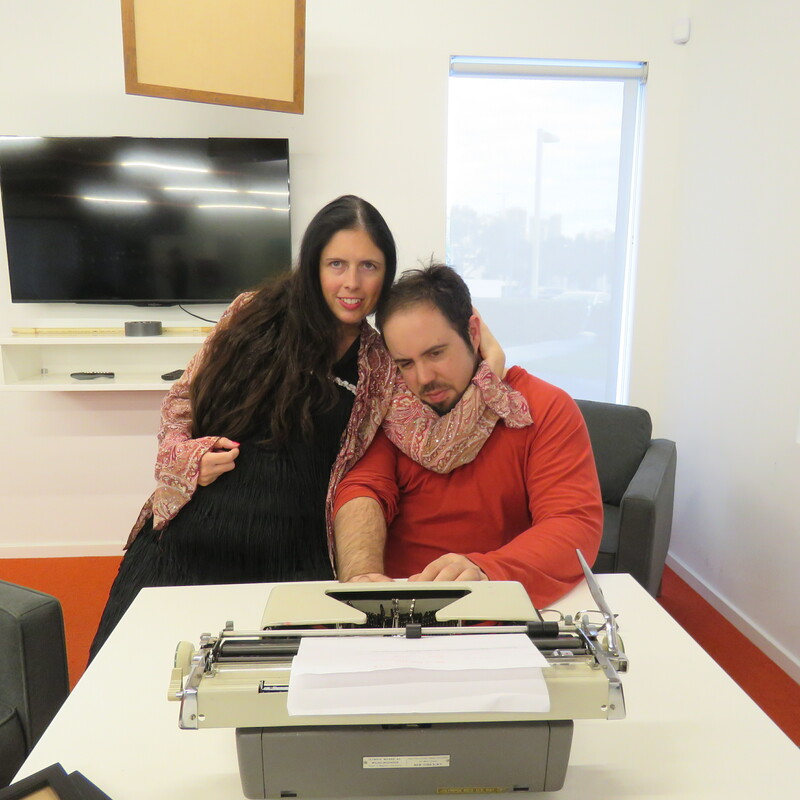 Rachel Galvin as Katherine & Alexander Marante as Donovan. Rachel Galvin is excited to be cast in two roles (Vera and Katherine) for a unique theatrical production entitled “Into the Stretch.” This production is comprised of an ensemble cast, including Alexander Marante, Andrew Brown, Olga Omvatii Gavrilenko. The piece is written and directed by Jefferson and will be shown at Actor’s Cultural Theatre in Ft. Lauderdale in March 2019. Posted in Acting. Tagged Acting, actress, experimentalplay, play, Rachel Galvin. Actress Rachel Galvin is proud to announce she is currently in a production of “Watchful Eyes Part 1,” directed by Jefferson. She plays a woman caught between worlds, trying to avoid going back into the void from whence she came and hopes to get back into her past, but the “transfer” has a firm grip on her. Galvin portrays essentially three characters and is the only actress on stage, interacting with voices, created by Daniel Jackson. At this time, she will be performing in two very intimate performances in Delray. The first has a date of August 25. The second is yet to be announced. More public performances will also be announced soon. Posted in Acting. Tagged actress, Rachel Galvin. Layered washes of color — lines, drips, dots of paint cover the canvas. The feeling is a sensory one, not cerebral, nor is it intended to be. Artist Madeline Denaro simply wishes the viewer to experience her creation, not necessarily interpret it. She compares her artwork to music. “Color is vibration … like music … Abstract art is more like that. I liken it to music. A lot of people wish to have words. When you leave the words, you just have the music without words telling you where to go,” she said. Denaro, who received a South Florida Cultural Consortium Fellowship for Visual and Media Artists for $7500 for her abstract paintings in 2011, considers herself a process artist. In what seems like a sacred space – her studio in the Third Avenue Art District of Fort Lauderdale – she begins her daily ritual. Her space is a bit like organized chaos. Her belongings are orderly. Everything has its place. There are plenty of open spaces. But within that openness is the table on which her tools run free – paintbrushes, paints, everything she needs for creation as messy as can be, but contained. “I have very messy brushes … I buy cheap brushes. I throw them out [if they are ruined because I don’t clean them fast enough]. I don’t concern myself with the quality of brushes, but I do concern myself with the quality of paint. I buy good paints,” Denaro said.Her wooden floor is spotted with evidence of her paint’s life energy. It comes out of its cage, off the table and frolics freely on the canvas. Stretching the canvas herself is part of the process – the birthing process, so to speak. The acrylics and polymers are like old friends who tell her secrets. She never knows what they will share next. Each day is a discovery. “I approach painting as if serving the painting, rather than trying to figure out what people are going to like. Each piece has to have a life,” she explained. Denaro paints starting on the floor or table and eventually putting the canvas on the wall. She never knows if a painting will take a month or a year. She just goes through the process five days a week and on the weekend if she has a show coming up. Each piece has a history. The layers stack upon the foundation; the foundation changes the quality of the new addition as much as the addition changes the foundation. There are quiet spaces, much like in her studio, transparencies, that allow the viewer to see what came first, to reflect on where it all began. “There is a lot of history of it. You think it’s hidden, but it’s there. I leave transparencies to see what came before,” she said.Denaro’s artistic journey began as a child. “My [artistic bent] started in my formative years. My mom knew a lot about fashion and color. She recognized the difference in colors – purple is more than just purple [it could be eggplant or lilac]. There are increments. She trained my eye,” she explained. She moved to Florida from the Bronx in the ’70s, but it wasn’t until her daughters were grown that she decided to go to school for art and attended the South Florida Art Institute in Hollywood, which is no longer in existence. She said it was in back of the Art & Culture Center when it used to be on the beach. There, she studied fine art, which included “anatomy, color, drawing, sculpture. When in art school, she also traveled in Europe. She was influenced primarily by art in Germany. “In Germany, the average person has art in their home. They take their art very seriously,” said Denaro, who recently completed her fifth solo show there. She considers German artist Joseph Beuys and Catalan artist Antoni Tapies to be among her biggest influences. She added, “We have been so influenced by intellect, but it is so slow; it gets in the way.”She had her first studio in 1986 in Dania. 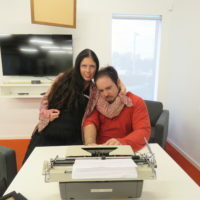 Two years later, she moved to a small studio in an alley in back of Las Olas Boulevard, across from where the Floridian restaurant is located. “That is when you start to become an artist… When you get out on your own,” she said. She began working in figurative abstracts, moving quickly into highly textured three-dimensional pieces that she classifies as sculpture. Wire mesh, steel grating, gauze, burlap and other metals jutted out of the canvas. Her pieces were grandiose, the framed ones were 94” x 102”; the tarps could be 12 feet wide. Their large size was cumbersome and too big for frames. These tarp paintings draped on the floor. Their hues were dark, their mood somber; but she celebrated the feeling within those hues. “It is the beauty of that sensitivity, of that feeling,” she said. Besides her sculptural pieces, she also did drawings in ink, charcoal or graphite on vellum. Those pieces won a $15,000 South Florida Cultural Consortium Fellowship in 2002. After completing her “New Forms” installation at the Museum of Art l Fort Lauderdale in 1999, which was made with beeswax over gauze over chicken wire, her style transformed. Her color became more formative, friendly, brighter and more vibrant. But she also continues to employ a lot of grays and off-whites, “quiet areas to balance the chatty areas,” she said. Her paintings also become more manageable and smaller, shrinking down to five feet square. She also had to abandon oils and turpentine due to a chemical allergy and move to acrylic and polymers. She is not sure what prompted the shift. But she does think that her pieces, perhaps on a subconscious level, do come out of her experiences, or at least the titles. She creates a title only after the piece is finished; it is only then that she analyzes what she has done. Denaro enjoys giving back to the artistic community. She works with several art groups. She has been a founding and active member of the Third Avenue Art District since 1995 (www.thirdavenueartdistrict.com). The group’s mission is to bring awareness of visual arts to the community through tours, lectures and their annual ArtWalk, in which they invite the community into the area to see art in neighborhood galleries and studios.In addition, she has been a founding and active member of Funding Arts Broward since 2002, a non-profit arts organization committed to preserving and cultivating the arts in Broward County. 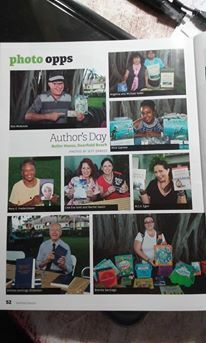 (www.fundingartsbroward.org). Denaro has shared her knowledge through lectures and art presentations for the Friends of the Museum at the Museum of Art l Fort Lauderdale and Nova Southeastern University. She is currently part of the pool of artist selection panelists for Broward Cultural Division’ Public Art & Design Program and has been a jurist for many art exhibitions. Although the majority of her work has been shown in New York, Atlanta and Germany, she has had a variety of exhibits through the years at many South Florida locations, including at the Art & Culture Center of Hollywood, the Museum of Art l Fort Lauderdale and The Girls’ Club, to name a few. In Feb., Denaro had an exhibit entitled “Driven to Abstraction” in Delray Beach at the Addison Gallery. When not creating life through art, she is exploring her spiritual life through The Fourth Way, a philosophy by G.I. Gurdjieff. She classifies it as a “way of bringing Eastern philosophy to Western mind.” She holds group meetings once a week in her studio and attends meetings elsewhere, in which the group performs “movements.” This philosophy also inspired popular German spiritual teacher Eckhart Tolle. Philosophical notions like experiencing things as they are, rather than labeling them, has greatly influenced her artistic process. To find out more about Madeline Denaro and her art, visit http://madelinedenaro.com. Posted in Samples of Writing Work. The teaser for “Coupons & Dreams,” will be released May 20th online for Facebook friends of the film. Please LIKE the page now. Rachel Galvin plays a restaurant manager and witch in the film. The teaser will be used to help with fundraising for the film. Posted in Gallery. Tagged Rachel Galvin. “The Palm Beach International Film Festival looks to have an engaging and fun year,” said local film critic Rachel Galvin, who writes and publishes a film magazine called Independent Streak. Posted in Gallery. Tagged film, Florida, Palm Beach International Film Festival, Rachel Galvin. Rachel Galvin’s articles about Summerfest (Symphony of the Americas)–pg. 28– and about media catered to artists –pg. 30– are now in print in the latest issue of Cultural Quarterly. Posted in Samples of Writing Work. Tagged art, music, Rachel Galvin, south florda, symphony. “Prowler: The Terror of Santa Carla” is set to go to a Film Fest in Cannes, France, according to director Ram Hernandez. Rachel Galvin did a voiceover as a reporter in the film and is pleased to hear it is headed to the fest. Hernandez said as many as 5000 people could be in attendance at fest. Posted in Gallery. Tagged Cannes, film, Prowler, Rachel Galvin. 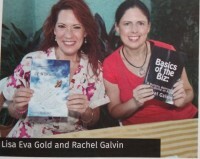 See Rachel Galvin’s photo, along with friend and fellow author Lisa Eva Gold, in the November issue of “Deerfield Magazine” from the Butler House in Deerfield Beach’s Authors & Autographs event. Interview of Gregory von Hausch, FLIFF CEO, and Brian Bayerl, their commercial’s director at FLIFF poster party unveiling for Artistic Times TV. FLIFF 2016 Poster Unveiling Party from ABPTV on Vimeo. Posted in Gallery. Tagged Alexandra Bello, Artistic Times, Brian Bayerl, celebrity, Deerfield Beach, film, Florida, Ft. Lauderdale Film Festival, Gregory von Hausch, ocean, Oceans234.